With nearly 72% of the vote, the Clean and Safe Neighborhood Parks Bond has been approved by San Francisco voters- who clearly love their parks! We would like to thank everyone who helped bring these much needed resources to our parks, especially every voter. With more than $1 billion in deferred parks maintenance, our parks need this measure so badly. And today, we can all celebrate this victory that gets us that much closer to making every park, playground, and recreation center clean, green, and safe. We will be in touch in the weeks and months ahead to describe the process and how Mountain Lake Park will benefit from the bond proceeds – and most importantly – when all that work will happen. Please stay tuned. As you may know, the restroom building at Mt. Lake Park is slated for replacement with a new restroom building that is designed for wheelchair accessibility and improved park maintenance operations. The future restroom building will also include a garage, a staff office, drinking fountains, and a bottle filler. The par course station to the south of the building will be relocated nearby. The Recreation and Park Department recently advised us that a construction contract has been awarded and that construction will begin shortly. Work on the project is now beginning. Earlier this month you probably noticed a portion of construction fence was put up on the backside of the restroom building. That is in preparation for the relocation of a PG&E meter and trenching. When those tasks are completed, then the restroom building will be closed to the public for abatement and demolition. That could be happening very soon. Information will be posted on the building five days before the closure to inform the public of the upcoming abatement and closure. The fenced-in area will be expanded to include the pathway in front of the building, which is the main area of construction activity. The total duration for this contract is 5 months. However inclement weather may extend this construction period. VOTE YES ON PROP B! Whether you read a book on a park bench, take your children to the playground, walk your dog in the park, listen to live music in Golden Gate Park or play a game of soccer on our fields, chances are you use our parks every week. Now you can support your parks by voting Yes on Prop B. Proposition B, the 2012 Clean and Safe Neighborhood Parks Bond on this November’s ballot will help the City tackle over $1 billion in infrastructure needs throughout our vast park and playground network. Proposition B improves existing facilities that are worn out from years of use; provides urgently needed seismic improvements that will make recreation facilities and playground equipment safer; constructs new waterfront parks; provides for shoreline restoration, replaces broken irrigation systems, and renovates failing playgrounds, and pools. In keeping with City policy, this bond will be funded as existing bonds get paid off, resulting in NO increase to property tax rates. Prop B is widely supported by Senator Dianne Feinstein, Congresswoman Nancy Pelosi, Senator Mark Leno, Mayor Ed Lee, the entire Board of Supervisors and School Board, the SF Democratic Party, the SF Labor Council, The League of Conservation Voters, the Trust for Public Land, The San Francisco Parks Alliance, The San Francisco Chronicle and the Bay Guardian. Prop B requires 2/3rd voter approval, so we can’t take anything for granted. This will be an extremely close election, so it is critical that you vote and you encourage your friends and family to vote Yes on B. Don’t just vote for President and turn in your ballot, vote for Prop B and the future of your neighborhood park! If you would like more information about the proposition or how to get involved, you may visit www.yesforparks.com, contact the SF Parks Alliance at [email protected], or call 415.516.9043. SFPA is the fiscal sponsor of the effort to renovate the Mt. Lake Park Playground. Did you know there we have a dedicated group of volunteers working towards the renovation of the playground at Mt. Lake Park? Friends of Mountain Lake Park Playground is a volunteer group of local residents dedicated to the renovation of Mountain Lake Park Playground as a community gathering space for our children and neighbors. Located in the Inner Richmond district, the playground sits at the end of 12th Avenue, north of Lake Street, and adjacent to the lake along the western boundary of Mountain Lake Park. The 30 year-old outdated play space is frequented by residents of many ages and we believe there is a great opportunity for an innovative playground and community space, given it’s unique woodland site. 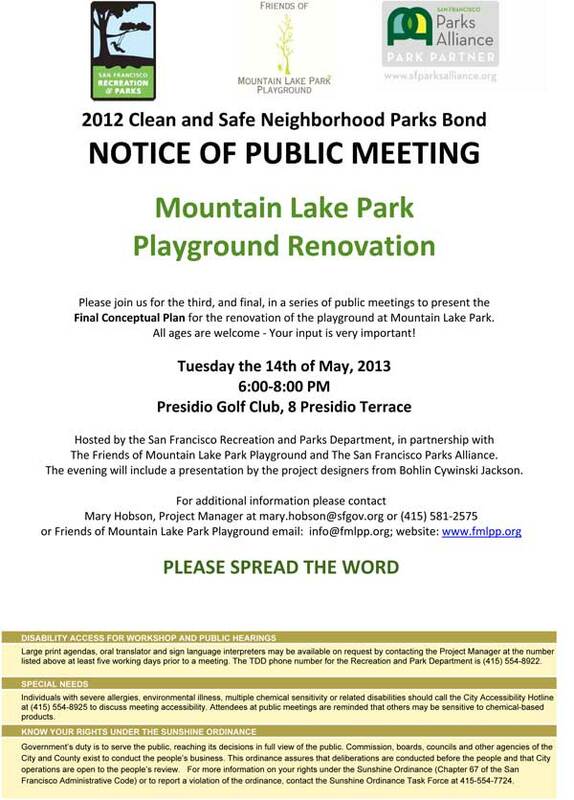 Together with the San Francisco Parks Alliance [formerly the Neighborhood Parks Council], Friends of Mountain Lake Park, and the San Francisco Recreation and Park Department, as well as community support, we hope to make this new playground a reality by 2014. This is a very exciting project for our park! To learn more information or to get involved in the effort, .